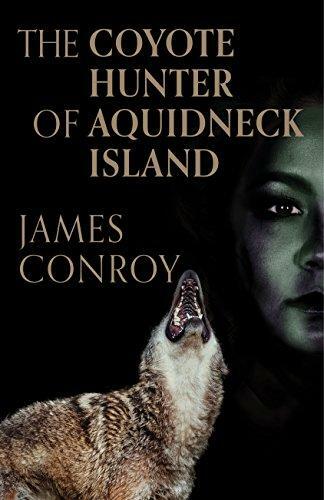 James Conroy’s new novel, The Coyote Hunter of Aquidneck Island not only introduces readers to a still rural bit of paradise set in Narragansett Bay, but to little known facts about indigenous New England Indian tribes…and coyotes. And, starting with the opening dialogue, the novel also introduces some good writing that brings together domestic drama, lore about the environment and some little-known Civil War military history. Conroy, a published poet and novelist from Long Island has an unusual story to tell and unusual protagonists to flesh it out. Micah LaVeck, a stoic, middle-aged retired federal civil servant with an incapacitating, incurable degenerative disease, lives alone in an unimproved cottage near the water and makes a living turning family journals into – he hopes – publishable memoirs. Kodi Red Moon, a young army veteran trained to be a sniper, is a professional hunter hired by the town to kill the invasive coyote population. Though Kodi’s working in conjunction with the Conservation Department’s Division of Fish and Wildlife, the town would like to keep the killings quiet, away from the press, gun groups and animal rights activists. And keep her identity secret. To that purpose, the mayor asks Micah if the hired gun can stay on a secluded part of his property. He says OK, not realizing that the sniper is an attractive 20-something young woman. Of course, the narrative is going to develop into a love story…but not a predictable one. Both Micah and Kodi are loners and come from totally different worlds. But Conroy skillfully develops a bond between them based on their growing appreciation of each other’s values – a love of Nature, contentment with private simple living and an abhorrence of violence, cruelty and corruption. As the story begins Micah is working on a manuscript, The Life and Times of Icobar Ohlm, given to him by an Ohlm family descendant and is frankly bored by the job and by Icobar who seems lackluster and aimless. No wonder Micah prefers to be curious about Kodi. And admiring. Word of her extraordinary hunting skill soon becomes the town’s main subject, especially for the mayor’s assistant, Micah’s spurned former lover who is determined to unmask the shooter and derail the hunt. Meanwhile, Micah grows increasingly interested in Kodi’s mystical way of life, and she in turn, in her cool taciturn way, comes to value his compassion and integrity. At the same time, Icobar’s story becomes darker and more intriguing, especially when Micah learns that after the Civil War Icobar turned his calligraphic talents as a forger for the Army into a shrewd move to protect his Indian wife, a niece of Chief Red Cloud, and their child. The time was 1871, when the Indian Appropriation Act turned Indians into wards of the state. A coincidence of themes? Sure, but the integration’s nicely done.